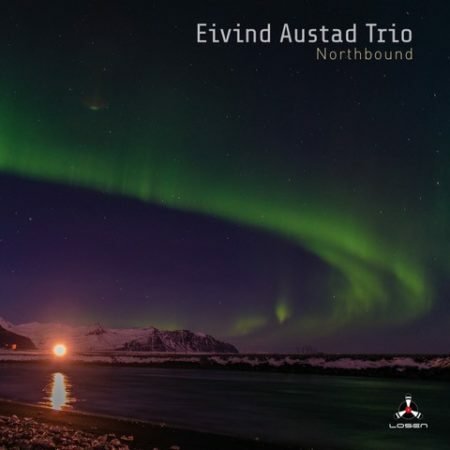 ‘Northbound’ is the second album from Norway’s Eivind Austad Trio, following 2016’s ‘Moving’ (Ozella). Once again, a handful of compositions by the bandleader are developed and given their final shape by the joint efforts of pianist Eivind Austad, double bass player Magne Thormodsæter and drummer Håkon Mjåset Johansen, and once again the track list also includes a slightly altered version of a David Bowie tune, this time the early-Bowie signature ‘Space Oddity’. “I’m not sure whether I should call it a homage”, muses Eivind Austad who concluded his first trio-album with the pop-icon’s ‘Life On Mars’. “I listened to Bowie back in the ´80s, but not that much, and only as an adult did I become aware of the musical strength of his songs and started to realise their potential for different interpretations. I keep this version of ‘Space Oddity’ fairly close to the original, but with a certain degree of dissonant harmonization and a different, chromatic ending”. Concerning his own seven original tunes on the album, Austad comments that he draws on different sources of inspiration. EA: There’s film music, baroque music, the ECM-catalogue, soul and gospel, which are a part of my background as a very young pianist, and of course jazz and improvised music, he says. When I compose, I like to work within time and tonality, and then, when the three of us start to explore the songs together, I want us to take our time, try different approaches and go where the music leads us. When we find the song’s right mood or atmosphere, that is normally a good starting point, and then it’s up to further give and take. If we end up beyond time and tonality, which sometimes happens, that’s fine; if not, that’s okay, too. Right now, I’m also preoccupied with finding out how to get to the core, to the soul of a song, in the most minimalistic manner, and then have the trio stay there, playing as close to the bone as possible. TM: What about the piano trio as such? ‘Leader-with-comp’ or ‘democratic collective’? EA: Like so many others, I have listened to the Bill Evans Trio and Keith Jarrett’s ‘Standards’ trio, but although they were huge influences at a time, ideals tend to change. Compared to ‘Moving’, I feel that the music on ‘Northbound’ is a little less inspired by the American jazz of the1960s and leans a bit more towards the modern European ideal. Not by intention, but because the songs turned out that way in the recording studio. TM: Had the trio played and prepared the material on the road before of the recording session in April 2018? EA: Only one of the tunes, the one called ‘Open Minded’. The others were written after 2016, but due to certain circumstances, I had to cancel a number of gigs in 2017, and as the three of us don’t live in the same city and we all are quite busy, we just managed a brief rehearsal before we recorded. We spent one day tuning into the studio and the following two days recording the album. TM: You are the leader of a trio playing mainly your own songs. What do you expect from Magne and Håkon in terms of support and challenges when you play? EA: I want to have a lot of input from them! We have known each other for more or less 20 years, and I don’t want us to sound pre-programmed. I may have an idea, a starting point, but when I bring it forward to Magne and Håkon and we start working, we very often end up with something quite different and better. To me, sounding perfect is less important than sounding vital, and I’d rather be challenged and surprised than play in a trio with no resistance, no interference, no dissonance in the interplay. That said, I also have to add that Magne and Håkon have never let me down on that.